One of the strangest regions with glaciers can be found on the equatorial island of Indonesia, here on the mountain range of Pegunungan Maoke, emerging from the tropical jungle and with peaks reaching heights of 4.884m (Carstensz-Peak, conquered only in 1962 in the Puncak Jaya massif) still ice fields persists, but they are continuous shrinking. Fig.1. 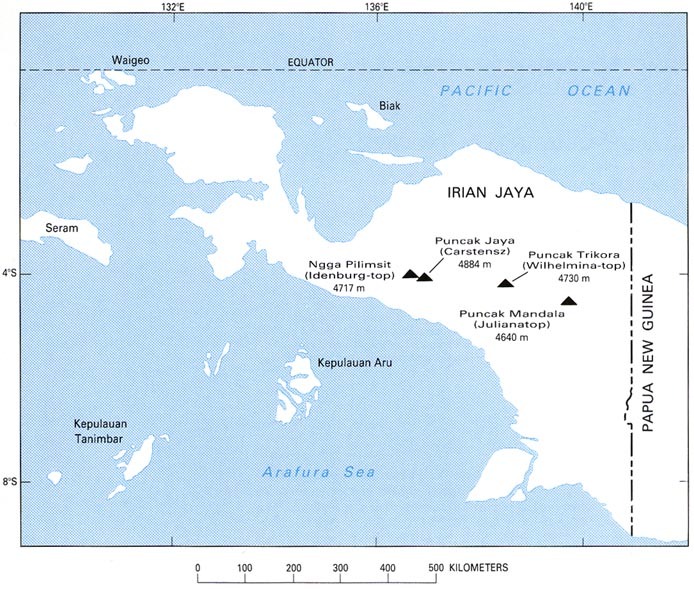 Index map of Irian Jaya showing the location of the highest mountains, figure from ALLISON & PETERSON 2000. A research team under the auspice of Dr. Lonnie Thompson, specialized on glaciers of the equatorial region, is actually trying to take as much ice cores as possible from the last persisting ice fields of the Carstensz-Peak. All the “glaciers”, a terminus to be adopted only if the ice shows an active movement, otherwise the correct term is “ice fields”, have experienced a pronounced retreat in the last century, and the predominant rainy weather of the last years on the mountains is melting rapidly the remaining ice and warming the bedrock. So in 2003 the ice field of the 4.760m high Puncak-Mandala and the ice field of Puncak Trikora (4.730m) disappeared, and the last remaining glaciers of the oceanic realm, the North Wall Firn, the Meren Glacier, and Carstensz Glacier surrounding the Carstensz-Peak, experienced massive volume and surface loss (less then one square kilometre persists) and got fragmented in various inactive parts. 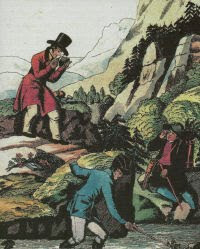 Fig.2. Oblique aerial photograph looking east at several of the glaciers on Puncak Jaya in 1936. Left to right: Northwall Firn, Meren Glacier, and Carstensz Glacier. Photograph from ALLISON & PETERSON 2000. Fig.3. 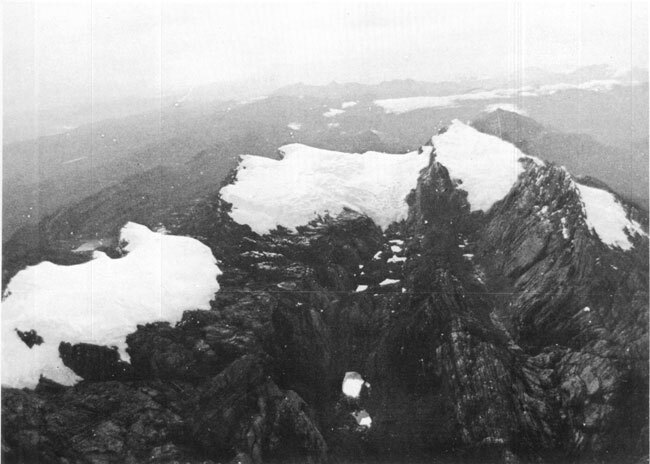 Oblique aerial photograph looking east at the glaciers in 1972. Photograph acquired during the Carstensz Glaciers Expeditions (CGE). Compare with figure 2. Photograph from ALLISON & PETERSON 2000. The researchers were able to recuperate two 30m long ice cores which show an annual layering and will be studied to determinate the climatic variability of the region. The ice-archive on the mountains of Indonesia's Papua Province are an important stratigraphic record for the climate at the border of the Pacific Ocean, one of the largest basins were thermic energy is stored in the sea or released to the atmosphere, influencing the climate on the whole planet. Hi David, Nice blog. I've organised the Australasia 3 Peaks Glacier expedition with the aim of climbing the 3 peaks you mention an creating a photographic record of the remaining glaciers on Puncak Jaya. Due to the remoteness of Puncak Mandala and the almost permanent cloud cover, researchers believe that the icecap on Puncak Mandala disppeared before 2003, but cannot be sure when due to the reliance on satellite imaging. A British expedition climbed the South Face of Mandala for the first time in 1999 and reported no icecap, only the presence of snow at the summit. 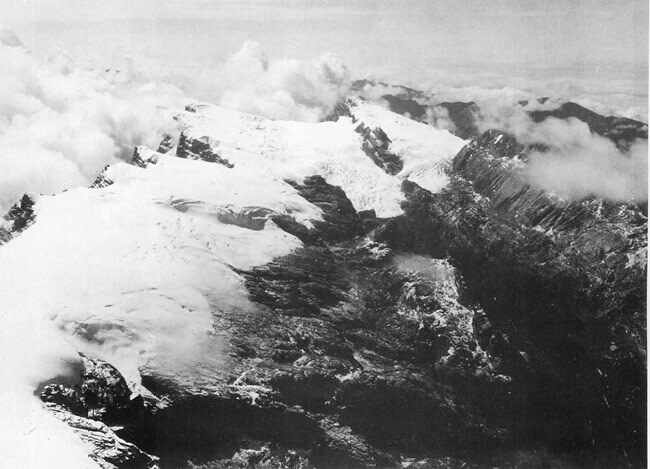 Puncak Trikora's icecap disappeared sometime between 1939 and 1962. It's great to see you highlighting this - let me know if you want any more info about our exedition. on the equatorial island of Indonesia?